11/24/2015: Added a 1918 advertisement for Reliance screwdrivers. 04/28/2011: Added BHM "Matchless" No. 133 Universal Pliers. 08/17/2010: Added a BHM No. 24 "Bull Pup" Valve Spring Lifter. 06/03/2009: Added a Ward's "Master Quality" 15/16x1 Open-End Wrench. 04/19/2009: Updated history and patents, added a Bridgeport Hy-Bar 5/16x13/32 Angled Open-End Wrench. 03/09/2009: Added BHM "Matchless" No. 133 Universal Pliers. 02/21/2009: Added a Bridgeport 9 Inch Auto Wrench. 03/22/2008: Added a Bridgeport Hy-Bar 5/8x3/4 Angled Open-End Wrench. 07/07/2007: Added a BHM "Master Quality" 731A Open-End Wrench. 07/02/2007: Added a BHM "Wards Master Quality" Open-End Wrench. 06/26/2007: Added a BHM "Master Quality" 27C Open-End Wrench. 06/25/2007: Added a BHM "Master Quality" 28S Open-End Wrench. 12/13/2006: Added a BHM Nickel Molybdenum Combination Wrench. 08/12/2006: Added Bridgeport (BHM) Slip-Joint Pliers. 06/09/2006: Added a Bridgeport Hardware Open-End Wrench. Bridgeport Hardware Manufacturing was founded in 1895 by Willis F. Hobbs as the Bridgeport Manufacturing Company, with an initial location on Knowlton Street in Bridgeport, Connecticut. Willis Hobbs had been involved previously in other business partnerships in Bridgeport, including the Wilmot & Hobbs Manufacturing Company and later a partnership with E.N. Sperry. Hobbs was an active inventor and received a number of patents for products produced by the company. In 1900 the company built a new factory and moved to 461 Iranistan Avenue, but a fire in 1902 forced a temporary move to other quarters. In 1902 the company was reorganized as the Bridgeport Hardware Manufacturing Corporation. The company was successful and grew steadily, and by 1915 had about 200 employees. The officers of the company at this time were Willis F. Hobbs as president, Harry B. Curtis as treasurer, and Arthur I. Platt as secretary. The advertisement at the left was published on page 273 of the February, 1918 issue of the Hardware Dealers' Magazine and shows a display stand for Bridgeport "Reliance" screwdrivers. The text notes rubberoid handles and a nickel-plated ferrule. Bridgeport Hardware Manufacturing made a wide variety of tools, with many of them produced as a contract manufacturer for other companies. The tools were frequently marked with the company's initials BHM, sometimes in the stylized BHM-Logo shown in our Logos Table. BHM sometimes made use of a somewhat unusual nickel-molybdenum alloy steel, so this may help to identify an otherwise unknown tool. In the early 1960s Bridgeport Hardware was acquired by Crescent Niagara, a holding company that had previously acquired Crescent Tool, Billings & Spencer, and the tool operations of Barcalo Manufacturing. Production of Bridgeport tools continued under the management of Crescent Niagara, and a 1967 Crescent catalog included a number of items from the Bridgeport Hardware line. The name "Bridgeport" was registered as a trademark with the first use given as 1928. Bridgeport used a number of unregistered brands for its products, including "Matchless", "Hy-Bar", and other names. Biographical information on Willis F. Hobbs, the founder of Bridgeport Hardware Manufacturing, can be found in the History of Bridgeport and Vicinity, Volume II, published by the S.J. Clarke Publishing Company in 1917. The section on Willis F. Hobbs begins on page 238, and the article provides an interesting account of the founding and early operations of the company. Product information was obtained from Bridgeport Hardware catalog No. 22 of 1923. Fig. 1. BHM Slip-Joint Universal Pliers, with Insets for Handle Pattern and Detail. Fig. 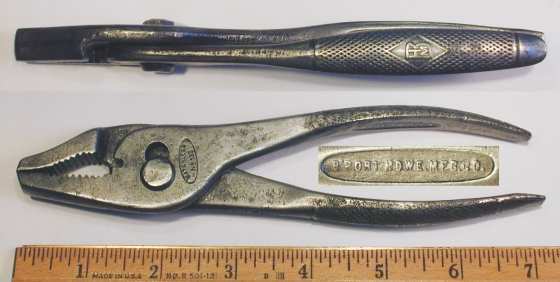 1 shows a pair of BHM 7 inch universal (combination) pliers, marked with the BHM Logo forged into the gripping pattern, and with "Bridgeport Line" forged into the underside (see lower inset). The next two figures show examples of the "Matchless" No. 133 universal pliers. Fig. 2A. BHM Matchless No. 133 7 Inch Universal Pliers, with Insets for Side View and Marking Detail, ca. 1920s. Fig. 2A shows a pair of BHM "Matchless" No. 133 7 inch universal (combination) pliers, stamped "Matchless" and "No. 133" inside an oval near the pivot. The handles have the BHM Logo forged into the gripping pattern, with "Made in U.S.A." (not shown) forged into the underside of one handle, and with "B'port Hdwe. Mfg. Co." forged into the other (see lower inset). The pliers earn their "universal" name by incorporating both flat and rounded gripping surfaces, a wire-cutting slot, a slip-joint adjustment, and a screwdriver tip on one handle. Fig. 2. BHM Matchless No. 133 7 Inch Universal Pliers, with Insets for Side View and Marking Detail, ca. 1920s. Fig. 2B shows a similar pair of BHM "Matchless" No. 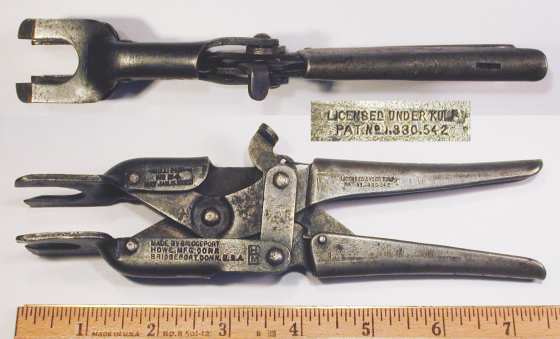 133 7 inch universal (combination) pliers, stamped with "Matchless" and the model number in an oval (see lower inset), but difficult to read due to rust and pitting. The handles have the BHM Logo forged into the gripping pattern, with "Made in U.S.A." (not shown) forged into the underside on one handle, and with "B'port Hdwe. Mfg. Co." forged into the other (see center inset). The overall length is 7.0 inches, and the finish is nickel plating. Fig. 3. BHM 9 Inch Auto Wrench, with Inset for Reverse Detail. Fig. 3 shows a Bridgeport 9 inch auto wrench, a common item for automobile tool kits. The wrench is marked with "B.H.M. Corp." and "Bridgeport, U.S.A." forged into the shank, with "Forged Steel" on the reverse. The overall length is 9.0 inches, and the finish is cadmium plating. Fig. 4. BHM No. 24 "Bull Pup" Valve Spring Lifter, with Insets for Side View and Marking Detail, ca. Late 1920s to 1930s. Fig. 4 shows a BHM No. 24 "Bull Pup" valve spring lifter, stamped on the lower jaw with "Made by Bridgeport Hdwe. Mfg. Corp." and "Bridgeport, Conn. U.S.A.", with the BHM Logo to the right. The upper jaw is stamped with a "Pat. Jan. 11, 1927" patent date, with "Licensed under Kulp" and "Pat. No. 1,330,542" on the upper handle. The patent date refers to patent #1,614,300, filed by W.F. Hobbs in 1926. The Kulp patent #1,330,542 was filed by H.W. Kulp in 1919 and issued in 1920. Fig. 5. BHM Nickel Molybdenum 3/4x7/8 Open-End Wrench, with Inset for Reverse. Fig. 5 shows a BHM 3/4x7/8 open-end wrench with a distinctive X-Center design, consisting of a central "X" with elongated darts on either side. The wrench is marked "U.S.A. Nickel Molybdenum" with "Patent No. 97325" on the reverse. The patent notice is a reference to design patent #D97,325, filed in 1935 with assignment to Bridgeport Hardware. Fig. 6. BHM Nickel Molybdenum 3/8x7/16 Box-End Wrench, with Inset for Reverse, ca. Mid 1930s to 1940s. Fig. 6 shows a BHM 3/8x7/16 box-end wrench with the X-Center design, marked "U.S.A. Nickel Molybdenum" with "Patent No. 97325" on the reverse. BHM is effectively using "Nickel Molybdenum" as an informal brand on this wrench. The patented design of this wrench allows BHM to be clearly identified as the maker, but other wrenches may be found occasionally with only the "Nickel Molybdenum" marking. The distinctive cross-and-darts design was also used for combination wrenches, although these are less commonly found. Fig. 7. BHM Nickel Molybdenum 3/8 Combination Wrench, with Inset for Reverse Detail, ca. Mid 1930s to 1940s. Fig. 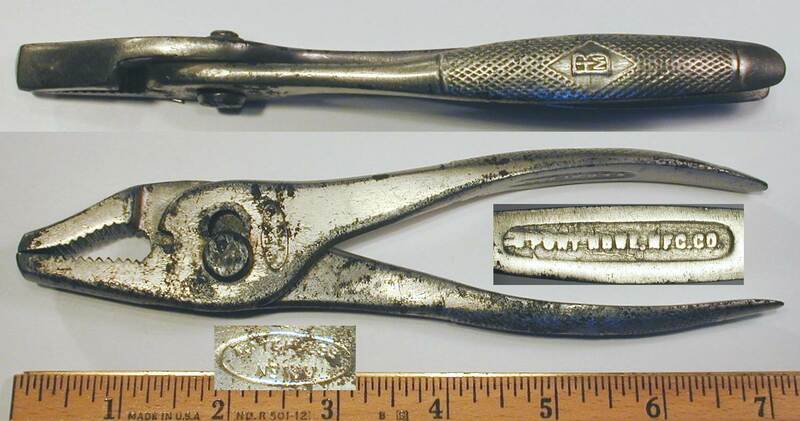 7 shows a BHM 3/8 combination wrench with the X-Center design, marked "U.S.A. Nickel Molybdenum" with "Patent No. 97325" on the reverse. The overall length is 4.6 inches, and the finish is chrome plating with polished faces. Bridgeport produced a line of open-end wrenches under the "Master Quality" mark, an unregistered brand used primarily by Montgomery Ward for its top-quality tools, but sometimes used by others as well. Some of the Bridgeport production includes the full "Wards Master Quality" name, but frequently only "Master Quality" was marked. Fig. 8. BHM 27C 9/16x11/16 Open-End Wrench, with Inset for Reverse Detail. Fig. 8 at the left shows a BHM 27C 9/16x11/16 open-end wrench, stamped with the model and BHM Logo on the face. The shank has a distinctive depressed panel design, with "Molybdenum Alloy U.S.A." forged into the front and "Master Quality" on the reverse. The overall length is 6.7 inches, and the finish is plain steel. Fig. 9. BHM 28S 5/8x25/32 Open-End Wrench, with Inset for Reverse Detail. Fig. 9 at the left shows a BHM 28S 5/8x25/32 open-end wrench, stamped with the model and BHM Logo on the face. The shank has a distinctive depressed panel design, with "Molybdenum Alloy U.S.A." forged into the front and "Master Quality" on the reverse. Fig. 10. BHM 731A 3/4x7/8 Open-End Wrench, with Inset for Reverse Detail. Fig. 10 at the left shows a BHM 731A 3/4x7/8 open-end wrench, stamped with the model and BHM Logo on the face. The shank has a distinctive depressed panel design, with "Molybdenum Alloy U.S.A." forged into the front and "Master Quality" on the reverse. The next two figures show examples of BHM production for the Montgomery Ward "Master Quality" line. Fig. 11. Ward's "Master Quality" 15/16x1 Open-End Wrench, with Inset for Reverse Detail. Fig. 11 shows a Ward's "Master Quality" 15/16x1 open-end wrench of the same distinctive design as the previous examples, but not marked with the BHM logo. The panelled shank is marked with "Molybdenum Alloy U.S.A." forged into the front, with "Wards Master Quality" forged into the reverse. Fig. 12. Ward's Master Quality 15/16x1 Open-End Wrench, with Inset for Reverse Detail. Fig. 12 shows another example of the Ward's Master Quality 15/16x1 open-end wrench, with somewhat clearer markings and again not marked with the BHM logo. The wrench is marked with "Ward's Master Quality" forged into the one side, with "Molybdenum Alloy U.S.A." forged into the reverse. The overall length is 9.8 inches. The finish is nickel plating, with losses due to rust and pitting. In later years (probably during the 1950s) Bridgeport introduced the Hy-Bar line of open-end wrenches, a distinctive design with the heads angled in the vertical plane for clearance. Fig. 13. Brigeport Hy-Bar 5/16x13/32 Angled Open-End Wrench. Fig. 13 shows a Bridgeport Hy-Bar 5/16x13/32 open-end wrench with angled heads, stamped "Hy-Bar" and "Bridgeport" on the face, and with "Forged Steel U.S.A." and the fractional sizes forged into the shank. The reverse shank has the approximate metric sizes "8 m/m" and "10 m/m" in forged raised letters. The overall length is 3.6 inches, and the finish is nickel plating. Fig. 14. Brigeport Hy-Bar 5/8x3/4 Angled Open-End Wrench, with Inset for Side View. Fig. 14 shows a Bridgeport Hy-Bar 5/8x3/4 open-end wrench with angled heads, stamped "Hy-Bar" and "Bridgeport" on the face, and with "Forged Steel U.S.A." and the fractional size forged into the shank. The reverse shank has the approximate metric sizes "16 m/m" and "19 m/m" in forged raised letters.